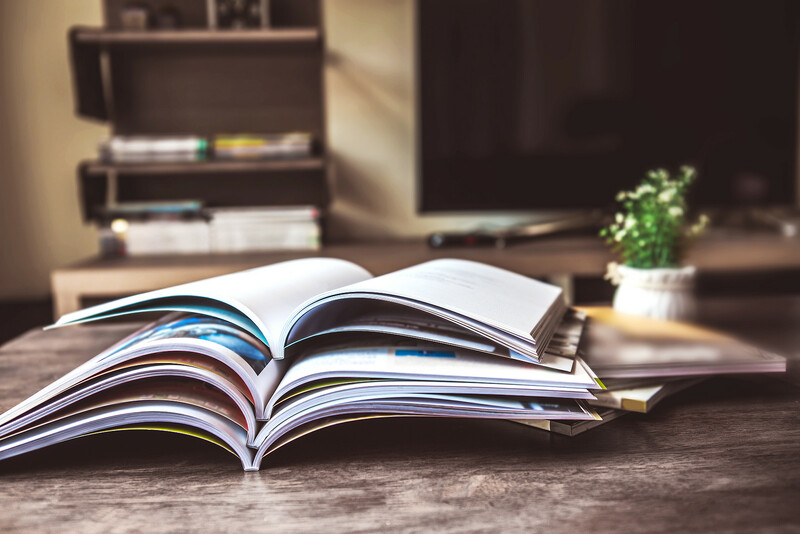 A quick overview of what licenses have been sold and which ones are about to expire can help sales teams create the right strategies for follow-up business. This is just one of the many evaluation methods offered by the new License Central Reporting. What does the new reporting tool offer? The new reporting tool is built upon on a newly developed and easy-to-use search engine with a diverse range of features. The search engine doesn’t just return static results in response to a search query. Rather it allows further flexible in-depth searches to be carried out on some of the obtained results in order to fetch detailed information about them. Each individual report comprises the search window, a summary view and a detailed view. Five different types of report exist: the license report, the order report, the ticket report, the customer report and the CmContainer report. The new menu structure facilitates quick generation of the reports. When the user selects an item from the menu, the search window for this report opens. The layout of this window is the same for all reports and hence simplifies data entry for the user. The search window is the key element to finding the required information quickly and easily. The layout of the search window has been designed to enable an in-depth yet easy-to-use search. Accordingly the search fields have been divided into two sections: the upper section contains the default search fields and the lower one the optional fields. The upper section is the same for all reports. The optional search fields can be used to specify additional comparison criteria for data. Typical examples could be selecting a group of items e.g. products, or specific data appended to the licenses in the information fields. The search can begin once the search criteria have been defined. The results are retrieved from the database and displayed in the summary view. The summary view shows on the one hand the search results; on the other hand it is the starting point for retrieving more detailed information about certain results. The summary view is displayed directly below the search window. This keeps the search criteria in view which makes it easy to refine the search. Criteria can be removed by unticking the corresponding box. In the same manner, the search can be narrowed down by selecting additional search criteria. The summary view provides a quick overview of the search results. The view’s contents depend on the selected report. 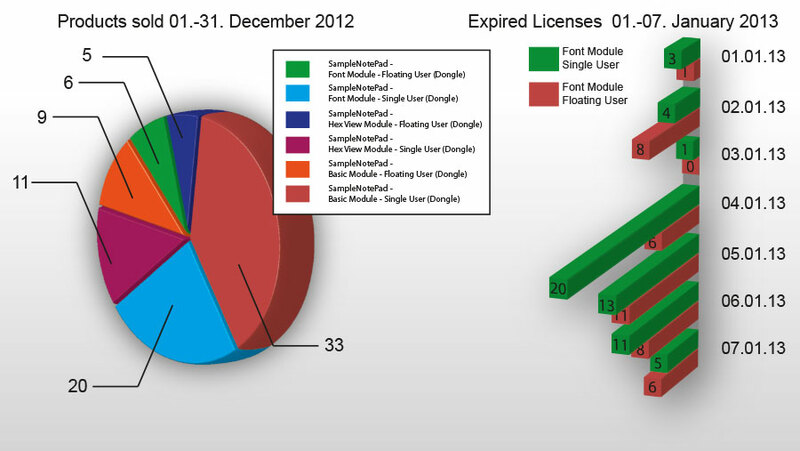 The license report is used here as an example to explain the summary view. 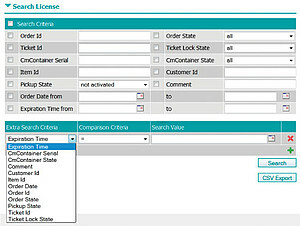 It displays the information stored in the following fields: last activation date, item ID, license name, license status, number of licenses, period of use, expiration time, maintenance period, number of activations, order date, order ID, ticket ID, customer ID and the CmContainer serial number. It also shows icons for the following features: not activated|activated just once|activated several times; returned|transferred|splitted; and contains fetch error|awaiting acknowledgement. A section of the search results is shown in the diagram below and includes information about the item ID, name, expiration time and customer number for licenses which expire within a specified time period. The summary view can be used as the starting point for unearthing more information about the displayed results. For example, it might be desirable to discover which other licenses belong to the order, or which CmContainers a license has been transferred to, if the license has been activated multiple times. Thanks to an automatic link created for each of the results, additional information can be retrieved quickly. A click on the license name in the name column is all that’s needed to open a new detailed view. The detailed view shows additional information about an individual license, a CmContainer, an order, a customer or a ticket. The detailed view is not the end of the road though. On the contrary more information can still be displayed. Just like in the summary view, you can click on some of the results to obtain more information about them. For example, the detailed view of the license report can also show information about the license, the orders for the license, the corresponding tickets and the CmContainers in which the license has been activated. A click on the customer ID, which is assigned when an order is created, shows detailed information about the customer. This could include a list of the licenses already shipped to him. Hence it can be ascertained which ones he’s still waiting for and that he might be expecting you to take some action to ensure they are shipped. How can I implement integrated reporting? How can I produce diagrams etc. from the search results? With the new reporting tool you can export the search results to a CSV file. CSV files can be opened by external programs such as Excel. These programs allow you to process the search results and display them in various diagrams. How can I integrate reporting into other applications? The structure of License Central comprises three components: the database, the web service and the user interface. Consistent with this structure, much attention was paid to the web service during the programming of the reporting tool to ensure this new service easily connects to your applications. That’s why a web service was developed with a method for each of the above-mentioned reports. The results fields continue to be mapped as complex types in the web service. 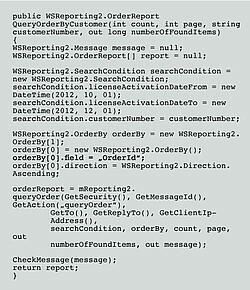 This means optimal support for connecting to development environments is possible, for example, through the use of IntelliSense in Microsoft Visual Studio. Our WIBU Professional Services team will be happy to help you make the connection!